[Solved] How to Fix ERR_SPDY_PROTOCOL_ERROR in Chrome? How to Fix ERR_SPDY_PROTOCOL_ERROR in Chrome? ERR_SPDY_PROTOCOL_ERROR is yet another error that many Chrome users have to deal with. Every user is different, and you may want to know what causes the ERR_SPDY_PROTOCOL_ERROR in Chrome while someone else might only want to know how to fix it. It’s always good to know what causes an error to appear so you can make the necessary changes. Also, by understanding the causes of the error, you know what not to do in the future. If you don’t know the reason, there is a good chance that you’re going to get the error again. The ERR_SPDY_PROTOCOL_ERROR in Chrome is easy to understand, and it’s also easy to fix. Just like any other error in Chrome, there are various methods you can try. If one doesn’t work for you, there is no other option but to keep trying until you come across a method that does work for you. Before trying the first method try to think of something that has given you problems in the past and choose the method that best fits that cause. Also Read: How to Fix “the application was unable to start correctly 0xc000007b” Error? What Causes the ERR_SPDY_PROTOCOL_ERROR in Chrome? Google created a protocol called SPDY, and it made it with the intention of making web pages load faster. It was also designed to improve web security, and both reasons are great, but since Google has stopped supporting this option, that could be why you’re getting the error in the first place. You could also be getting the ERR_SPDY_PROTOCOL_ERROR in Chrome because the Chrome version you are using needs an update or maybe your antivirus or Firewall just don’t get along with it for some reason. Let’s see how you can make this error go away. There are a number of ways to fix ERR_SPDY_PROTOCOL_ERROR in Chrome. If you want to permanently fix ERR_SPDY_PROTOCOL_ERROR in Chrome, you have to find a way by hit and trial method. Start fixing the error with trying one of the below-mentioned fixes, if one method doesn’t work, try another. You’ll be able to find one of the methods that work for you in fixing the error ERR_SPDY_PROTOCOL_ERROR in Chrome. Tech giants such as Google are always telling us to have the most recent version of any software you are using. The reason for this is that those updates fix bugs that can cause these kinds of problems and improve overall performance. To see if you have the most recent version of Chrome click on the three vertical dots at the top right and place the cursor over help. More options will appear to the left, and one of those options will be the About Chrome option. Click on this last option, and the browser will start checking for any updates that may be available at the time on its own. If Chrome is updated to date, it will tell you if not, it will start updating it automatically. Once Chrome is done updating, close Chrome and restart it and the problem should no longer be there. Keeping things clean and in order is always a good thing, and that also goes for Chrome. With time, certain data and cookies can become corrupt and can cause problems. That’s why you should always clean them from time to time to avoid any issues this may cause. Thankfully, there are many browser cleaner tools as well. 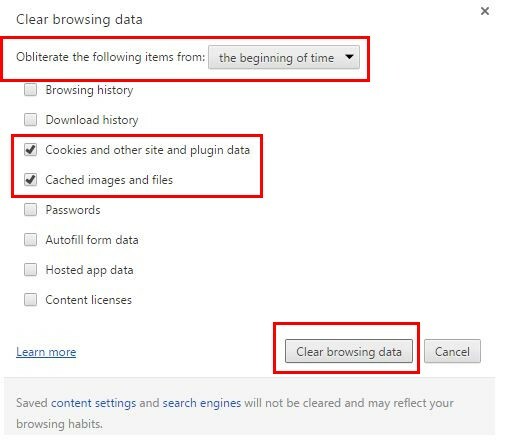 To clean Chrome’s cookies and data manually, go to the browser’s address bar and type chrome://settings. Make sure to press Enter and when the list of options appears, scroll all the way down until you can find Show Advanced Settings. Don’t worry about missing the option since the page ends where you will find it anyway. Look for the Privacy option and select the Clear Browsing Data. Don’t forget to check the Cookies and other site and plug-in data and the Cached images and files option. If you see that something else besides these options is selected, uncheck them. Your browser should look exactly like the picture below. At the top, Chrome will have an option so you can choose the amount of data to get rid of. I would recommend that you select the beginning of time option. Click on Clear Browsing Data and try to access the site you wanted to see when all of this started. If you had trouble with the first option you can also try going to chrome://net-internals/#sockets. Despite the option you decide to take, you will see a drop-down menu at the top right of your display. It has the shape of an upside down pyramid. Click on it and choose Flush Sockets option that will be in plain sight. That’s all there is to it. Check to see if you still get that ERR_SPDY_PROTOCOL_ERROR message. Sometimes, Chrome just needs a good cleaning of just about everything. To clear the Host Cache and the DNS Cache go to chrome://net-internals/#dns and in the middle, you should see the Clear host cache button. That’s all you have to do to clear the shot cache but to clear the DNS Cache; you will need to use the command prompt. Open it by right-clicking on the Windows Start menu and right-click on the Command Prompt option to choose run as Administrator. When it’s open, type in the following commands: ipconfig/flushdns and then type in ipconfig/release. Resetting Chrome’s settings could be the key to not seeing ERR_SPDY_PROTOCOL_ERROR error anymore. Go to chrome:settings/resetProfileSettings. Immediately after visiting the page, Chrome will show you a message telling you that your settings will be restored to its original settings. This also involves disabling your extensions, resetting your new tab page and it will also unpin all tabs. If you are sure and you want to do this go ahead and click on Reset. There have been reports that those who use Avast Antivirus are experiencing this problem because of the antivirus itself is causing it. It has been known that Avast will block specific sites and then show you this error. You can easily get around this by making a few changed to Avast’s settings. Access the software’s settings and then go to Active Protection. Look for the Customize for “Web Shield” option and then add the sites you regularly access so that Avast won’t block them in the future. Hopefully, you won’t be in a hurry when doing this you will need to add them one by one. It’s not just Avast that could be doing this. It could very well be whatever antivirus you are currently using. Try disabling your antivirus for just a moment and see if you are still getting that error. Double check the commands for any mistakes and then press Enter. Now, reboot your Windows computer and try accessing that site again. Also Read: How to Fix “msmpeng exe antimalware service executable” Error? Having to deal with these kinds of error when all you want to do use Chrome can be frustrating. There are times when you will never know what caused the problem but what matters is that you find the method that can make the problem go away. One last tip that you can try is to renew your IP address. If you still have the command prompt open, you can type in the ipconfig/renew command. Press Enter and that will refresh your IP. It’s a mystery why your IP could be the culprit, but it’s never a bad idea to try as many methods as possible. Hope, this fixes ERR_SPDY_PROTOCOL_ERROR in your Chrome browser. If you have tried a method that has worked for you and that I have not mentioned, don’t forget to share with us in the comments. That way others with the same problem can benefit from it as well. TRP Guides: How to Embed a YouTube Video in PowerPoint Presentation? How to Fix YouTube Videos Not Playing on Android, iPhone, Mac, and PC? Svchost.exe: What is Svchost.exe and How to Fix Svchost.exe High CPU Usage? Next: Clean Master App Review: Is Clean Master a Good App? Does Clean Master Really Work?